R A Acosta, M A Brunet, J C Córdoba (2017): “The quality of the journalistic information of elespectador.com. The case of the Plebiscite for Peace, 2016, in Colombia”. Revista Latina de Comunicación Social, 72, pp. 1.502 to 1.514. Introduction. The article analyses the journalistic pieces produced and published by the newspaper elespectador.com during the electoral process of the Plebiscite for Peace 2016, in Colombia. The paper examines which are the information sources used by journalists to elaborate news, what are the journalistic genres used as well as the number of sources in each informative note. Methodology. Analysis of descriptive nature using a mixed methodology, that is, quantitative and qualitative techniques, therefore we considered content analysis as an efficacious tool to achieve our objectives. Results. news and opinion outstand as the preferred narrative journalistic genres; while the presence of documentary sources invigorating information is rather low. Conclusions. The poor journalistic quality is evident, resulting in a misinformed public opinion, fertilizing and conceiving a statements journalism. Agenda setting; information sources; elespectador.com; journalistic quality; news. Citizens inform themselves about what happens in places they cannot be through social media, building a view of the existing reality. However, they are not the only ones, because today information and communication technologies generate a considerable effect on public opinion. We understand that the needs of information are complex maps depending on particular interests of individuals and it is through media where citizens try to satisfy that need, we find that the reading and interpretation that media make of political processes influence in building, arguing or undermining perceptions about what happens, about what is convenient, about what is involved and in a relevant manner, about concepts made by citizens of Democracy, State, Elections and Management (Hernandez, 2014). In said context, this paper emphasizes in a descriptive manner, on the types of sources used by journalists during processes of journalistic production of the newspaper El Espectador, in its digital version (https://www.elespectador.com/noticias), during the electoral process of the Plebiscite for Peace of 2016, in Bogotá, Colombia; looking for fundamentals that allow us to understand and explain the journalistic quality of this media; therefore, we considered suitable to analyze it from the perspective introduced by the agenda setting theory, which proposes that social media are the ones stablishing the themes of which citizens talk about day to day (McCombs, 2006). That is, that journalists, through their production routines build a version of reality from the information gathered that will be submitted afterwards to the selection process that determines what is included, what is excluded and the level of importance or relevance in media (Acosta, 2012, p.173). In this contribution we introduce the analysis of the journalistic pieces published by elespectador.com; we study the themes made visible by the media, the journalistic genre, types of sources, the gender of said sources, and the number of sources used in the journalistic production processes. The research that sustains this paper is supported on the studies of the sociological trend of newsmaking, which “approaches and understands the news production mechanisms, from the consideration of professional culture, organization of work and journalistic routines” (Arrueta, 2010: 11). The role of sources in the development of journalistic production routines is highlighted, since they operate as another selector (gatekeeper) when it comes to determining the media agenda. As a consequence, we profile the study in the approach explained by the agenda setting theory in what it is known as its fourth phase of development, centered in “researches focused on sources of the media agenda within the news market” (Casermeiro de Pereson, 2003: 22); and “how good faith is not the most common characteristic of specific sources, mainly the official ones, I believe skepticism is the main element in our relationship with them” (Pena de Oliveira, 2009: 62), therefore, there is the need for an analysis that allows to stablish what kind of information sources journalists go to when performing their routines of news production, in the idea of stablishing the journalistic quality of the media considering the number, quality and diversity of sources consulted. With the slogan of “a political, literary, news and industrial newspaper” (Cobos Castañeda, cited in Oviedo Botero, 2016), El Espectador announced abundant up-to-date and reliable news. The name was the result of the admiration Fidel Cano Gutiérrez had towards the poet Víctor Hugo, who collaborated in France for a newspaper with that same name. On its part, in its beginnings, El Espectador of Colombia,was published twice per week, on Tuesday and Friday with a quarter fold size edition and 500 copies printed. Don Fidel Cano wrote most of articles: the editorial notes and columns "Noticias" and "Mesa Revuelta"; therein, he stated his convictions about political and moral life, with the same courage with which he pronounced against all forms of arbitrariness and violation of human rights, of the Constitution and laws (Iriarte, 1937). This caused the closure of the newspaper several times. The first time, on July 8, 1887, when it barely had 134 days of circulation and by order of the Government of the president back then, Rafael Núñez. This closure was caused by the position of the Catholic Church before a newspaper with liberal ideas, represented among others by the Medellin bishop Bernardo Herrera Restrepo, who forbid the reading of El Espectador, because he considered it a sin due to its attacks towards the Institution, for instance with the publication of a note such as “the contrast between the poverty and humility of Christ’s apostles and the sumptuous nature with which the Church prepared the celebration of the Golden Jubilee of Pope Leon XIII” (Arias, 2012). The eighties were tough for the newspaper, which had Grupo Grancolombiano as main collaborator economically (Cardona, 2007) and, therefore, it looked after the treatment of news and information therein; however, despite that, several reports about illegal loans and irregularities against the Group were published, which caused new economic problems. El Espectador had most of its advertisements on its pages suspended, weakening the economic endurance, the newspaper continued to inform and demanding press freedom though, without relying on the support of numerous banks and companies from the country, because most removed their advertisements. In this paper we perform an analysis of descriptive nature using a mixed methodology, that is, quantitative and qualitative techniques, therefore we consider the quantitative content analysis of media as an efficacious tool which, in the words of José Javier Sánchez Aranda “is what allowed to obtain data as basis for a serious and rigorous study about that reality” (2005: 207). Likewise, that kind of analysis is understood as “any research technique helpful to make inferences through the systematic and objective identification of specific characteristics within a text” (De Ole R. Holsti, 1969, cited in Sánchez, 2005: 212), since said tool “allowed to obtain data as basis for a serious and rigorous study about that reality” (Sánchez, 2005: 207). Hence, we performed the data collection and its coding using analysis units, the journalistic pieces made visible by elespectador.com during the electoral process of the Plebiscite for Peace. While the methodology applied in the study was the quantitative content analysis perspective, we based on the sociological perspective called newsmaking, which studies and understands the news production mechanisms from the consideration of the professional culture, organization of work and journalistic routines (Arrueta, 2010). Given said orientation, we considered the agenda setting theory that allows understanding and explaining that social media are the ones stablishing the public agenda, that is, citizens’ agenda, because they decide the themes to be published through the journalistic pieces and the management of topics, emphasizing on some and minimizing or omitting others, therefore profiling the discussion lines and the tones on electoral campaigns. From the aforesaid, emerges the questioning that sustains this research about how the agenda setting of elespectador.com was produced. The theory questions who fixes the public agenda and under what conditions (McCombs and Shaw 1972); in said direction, it has been confirmed that media, through its selection processes are the ones performing these tasks since they include, exclude and rank; thus, they determine what are the themes citizens talk about to build their image of reality. We understand then that “media are not a neutral, logical or rational mediator of social events, but instead they basically help reproducing reformulated ideologies” (Van Dijk, 1990:28). It is clear that the decisions made in the moments prior to the development of the productive processes of the journalistic text are not naïve, nor in the moment of practicing the gatekeeper function either. That is, just as Acosta says (2012) the selection process that entails the inclusion, exclusion and ranking of information involves an ideological load that is reflected in the administrative processes implicit in said production routines that are part of the same structure and interest of media. Likewise, it is necessary to keep in mind what the role of sources is during that tripartite relationship of conflictive and asymmetrical nature stablished between journalists, media and sources themselves, since it is no secret that sources are only willing to provide information that confirms their status on media, especially when journalists select the professional opinion makers for their journalistic pieces: politicians, intellectuals, economy experts or, in general, men and women positioned before public opinion for some reason. Therefore, “it seems logical that sources offer information about what they are interested in the most and, on the other hand, what they have closer to them as well. Almost everyone tends to talk about themselves” (Mayoral, 2005: 100). In said context, the capacity of sources for scheduling themes in the media agenda is clear, because the need of media for socializing the public opinion gives no break, turning sources into their efficacious capital when it comes to inform. The time period to study elespectador.com ranges from August 24, to October 9, 2016, constituting a sample of 47 days. The registry and analysis units were the journalistic pieces produced and made visible by elespectador.com. The sample selected for the analysis of the media was nonprobabilistic or directed (Hernández-Sampieri, Fernández-Collado and Baptista-Lucio, 2010: 176), and it consisted of 453 journalistic pieces. When dividing the total number of pieces (453) by the number of days (47) included in the study, results that there is a daily baseline analysis of 9.63 journalistic pieces per day, in average. Data collection was performed from the registry of journalistic pieces of the newspaper El Espectador in its digital version in the city of Bogotá, Colombia. The gathering of data to start the analysis process was made from the registry during the selected 47 days in the database. Once collected, these data were edited and included in a specially designed platform to structure information and be able to have selected variables. Journalistic pieces were systematized, from predefined variables, for registration and operationalization, after downloading them from a database into Excel tables sheets. Said process allowed the subsequent analysis and interpretation of the information obtained through tables and graphics. Variables analyzed in this study were: number of sources, number of sources by journalistic piece; typology of journalistic, personal and documentary information sources; gender of sources, either male or female; journalistic genres: news, column, report, interview and profile, and social actors. The period considered to study the journalistic pieces of elespectador.com ranged from August 24 to October 9, 2016, consisting of a 47-days sample. The registry and analysis units were the journalistic pieces produced and made visible by elespectador.com. On the days considered for the study, there are 453 journalistic pieces registered and selected that include news, opinion, reports, interviews, editorials, special reports, profiles, briefs, column and photonews. 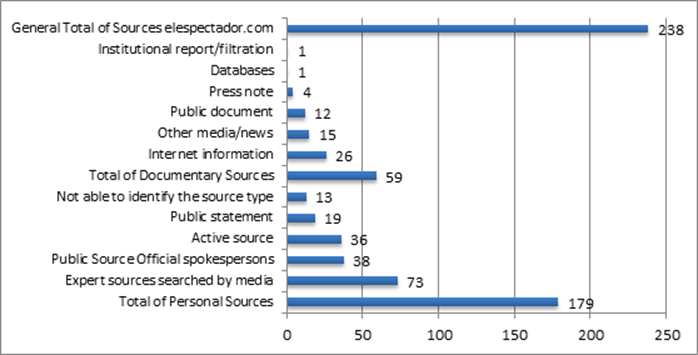 The character of elespectador.com regarding who are responsibles for information collection and the production of journalistic pieces is clear, because from the 453 pieces published about the Plebiscite for Peace issue, they produced 410, while the remaining 43 were from news agencies, that is, that 90.5% of information made visible by the media was of its own journalistic production and 9.5% was external production. It is important to outstand that, possibly, the initiative in the search of breaking news comes from information sources; as could be identified in a research performed by the Pontificia Universidad Católica de Chile where it was said “that in Argentina, Colombia and Perú between 2004 and 2009, the initiative of sources in breaking news increases until reaching values superior to 40%” (Pellegrini et al., 2011: 163). Specifically, in Colombia, on the year 2004 it was 26.8% and for 2009, 48.7%, showing a solid increase compared to the dependency of the journalist in his or her information sources for the search of breaking news. Cecilia Flachsland says that “those who have the symbolic capital have the power of ‘doing things with words’ that is: to build the truth and impose a specific vision of the social world, stablishing criteria of social differentiation, and classifying and building social groups” (2005: 57); under said circumstances the role of journalists as selectors (gatekeepers) is clear, because they are bound to include, exclude and rank the themes in media agenda; in said journey, they stablish asymmetric forms of interaction with the sources of journalistic information, which in some way determine the elements with which the social reality will be built. During the electoral process of the Plebiscite, the main theme talked about by sources during the elaboration of elespectador.com agenda, was the process of endorsement of the Peace Agreement, with 323 mentions out of the total 693, outstanding with 47%. The theme that follows with a rather inferior percentage is political participation, with 13% of mentions; and then there is the theme of the general agreement for the termination of the armed conflict in Colombia with FARC, with a 12% (Graphic 2). However, issues equally solid for the Peace process such as the funding of peace agreements, the victims’ issue and the transitional justice topic, among others, where not significantly mentioned by sources used by elespectador.com. Regarding the nature of the journalistic sources used, during the routines of journalistic production elespectador.com mainly used sources of personal nature (Graphic 3); under said circumstances, “these data reflect that this kind of source matches well with the apprehension modes of Latin-American countries, where the personal solidarity, emotion and a affective identification relationship with the external world play a very important role in its collective interests” (Pellegrini et al., 2011: 150-151). From the total (238) sources used, human (75.21%) were consulted the most to inform about the electoral process; and documentary (24.78%). It is evident that journalists do not contrast information produced by human sources with the support of documentary sources. It is important that highlight that from the total (238) of sources consulted by journalists, expert sources were used in a majoritarian manner, which in a way allows to explain and inform citizens about the electoral process of the plebiscite for Peace with objectivity; aware that the use of the post-truth concept was an outstanding element in the development of this campaign, since the electoral process was invaded by false news. In the electoral process in Colombia the use of male journalistic information sources to obtain data is repeated and predominant, because in the 453 journalistic pieces analyzed in this research, it is clear that journalists turned to male sources in 81% of the total of pieces (graphic 4), evidencing the low relevance that women’s opinion about the electoral process represent for the media. However, it is worth mentioning that there is a quota law in Colombia “in a specific moment, not to discriminate women laborally was set forth by law, and therefore they could be able to participate in directive positions”, nevertheless we observe how they are not consulted equally in this media to talk about the electoral process of the Plebiscite for Peace. Once the variable of social actors of information was analyzed, we could confirm that in elespectador.com the male gender conquers the public arena when it comes to inform about the electoral process of the Plebiscite for Peace. That is, one of the repeated evils of the social media in Colombia is evidenced: the masculinization of information and, as a consequence, the masculinization of electoral politics; in other words, there is talk about men and men are the ones asked. Another outstanding feature in the fabric of information during this electoral process in elespectador.com is the low use of journalistic information sources when it comes to produce viewed information, because there were used in total 238 information sources (graphic 3) between personal and documentary to produce 453 journalistic pieces, therefore there is an average of less than a single source per news (0.52), unveiling the low quality of information produced and made visible through this media; that is, not enough sources are used, which is accompanied by a consequence, “the public agenda is trivialized at the pace of the sources needs” (Luchessi and Videla, 2016: 64). The most used journalistic genre to inform about the Plebiscite for Peace, was news with 70%; followed by opinion with 22% and, afterwards, there are interview and report with a 2% each one. In such scenario, “we can confirm that media agendas tend to put aside to a marginal position the use of more interpretative genres, inclined to offer elements of contextual and testimonial nature, capable of offering a greater density and deepness to information” (Bonilla and García, 2004: 34). With said argument, we coincide symmetrically with what Tamayo and Medina said regarding that “most used genres are those where the immediate recount of facts predominates, as well as the record of what is happening” (2008: 28); given the situation, a low journalistic quality is revealed in elespectador.com. The column and report which are more time consuming and entail a deep report commitment are scarcely used in elespectador.com. These journalistic genres would allow a greater deepness in the presentation and discussion of public agenda issues, because while requiring a superior journalistic research, they are obliged to consult a greater number, quality and diversity of sources of journalistic information; in such a way that pieces produced could properly inform public opinion; since in times of post-truth there is need for reporters that are capable of certifying the information that is produced and socialized through social media; for there is the need that today’s reporters play the role of notary public of events to avoid the increasing flow of false news, since there is a lot published but what is informed, insufficient. The low journalistic quality is evident, if we look at the exiguous number of sources, added to the fact that there is no corroboration and even the verification of data through the use of documentary sources is not done, considering that from a total of (238) sources, only (59) are documentary sources and the rest (179) are personal sources, which evidences lacks in the quality of journalistic production, since there is no possibility to compare and verify information using independent or expert sources. Therefore, the outcome is the configuration of a statements journalism, where the different points of view are not presented, resulting in a social reality configured from the view of a reduced number of sources; and sources with interests that in most cases are evident through the type of agenda configured and made visible by elespectador.com. In this context it is necessary to implement journalism of accuracy based on quality sources: in order to recover their credibility, because the main (public) sources are marked by the skepticism; given the situation, it is necessary to consult a greater number of sources and diversify them, in such a way that there is more informing and less publishing, to be able to deliver enough judgement elements to the citizen, so that a right image of the social reality can be elaborated. The lack of journalistic quality that results, finally, in a well-informed public opinion is unquestionable; because, besides, the need of giving more visibility to other social actors not present in the public scenario is unavoidable. Acosta, R.A. (2012): “El papel de las fuentes de la comunicación periodística en la construcción social de la realidad”. En Miradas latinoamericanas sobre periodismo. Fuentes confiables. San Salvador de Jujuy: Editorial Universidad Católica de Santiago del Estero UCSE-DASS, pp. 165-188. Arias, A. (2012): “125 Años: Sin callar ni arrodillarse”. En El Heraldo, 9 septiembre Recuperado de http://www.elheraldo.co/blogs/125-anos-sin-callar-ni-arrodillarse-61612. Aruguete, N. (2015): El poder de la agenda. Política, medios y público. Buenos Aires, Argentina. Editorial Biblos, Cuadernos de Comunicación. Aruguete, N. (2009): “Estableciendo la agenda. Los orígenes y la evolución de la teoría de la Agenda Setting” [versión electrónica]. En: Ecos de la Comunicación, 2 (2), [recuperado el 22 de octubre de 2017 de http://bibliotecadigital.uca.edu.ar/greenstone/cgi-bin/library.cgi?a=d&c=Revistas&d=estableciendo-la-agenda]. Arrueta, C. (2010): ¿Qué realidad construyen los medios? Una mirada desde el periodismo en contextos de periferia. Buenos Aires: La Crujía Ediciones. Bonilla, J.I. y García, Alma (2004): ¿Qué es noticia? Agenda, periodistas y ciudadanos. Bogotá: Pontificia Universidad Javeriana. Cano, F. (2012): 125 Años de El Espectador, 6 septiembre 2017, [recuperado de http://www.agendasamaria.org/wp/2012/03/125-anos-de-el-espectador/]. Cardona, J. (2007): La opinión es Noticia. El Espectador, Emisión Postal. Bogotá (Servicios postales Nacionales). Casermeiro de Pereson, A. (2003): Los medios en las elecciones: la agenda setting en la Ciudad de Buenos Aires [en línea]. Buenos Aires: Educa, [recuperado el julio 18 de 2013, de http://bibliotecadigital.uca.edu.ar/repositorio/educa/medios-eleccionesagenda]. Cohen, B. (1963): The Press and Foreing Policy. Connecticut University of California. Flachsland, C. (2005): Pierre Bourdieu y el capital simbólico. Buenos Aires: Editorial Campo de Ideas S.L. Hernández C., Fabián (2014): Elecciones y Medios de Comunicación. Un zoon a las mujeres en la agenda política. Editorial Torre Blanca: Bogotá. Hernández, S. R, Fernández, C., C y Baptista, L. P, (2010): Metodología de la investigación. Quinta edición, McGraw Hill Interamericana Editores. Iriarte, H. (1937): Biblioteca virtual del Banco de la República Bibliografía de Cano Gutiérrez Fidel, [recuperado el 23 de octubre de 2017 de http://www.banrepcultural.org/blaavirtual/biografias/canofide.htm]. Lippmann, W. (1964): La opinión pública. Buenos Aires, Argentina. Compañía General Fabril Editora. Luchessi, Lila y Videla, Luciano (2016): Desafíos del periodismo en la sociedad del conocimiento. Buenos Aires: La Crujía Ediciones. McCombs, M. (2006): Estableciendo la Agenda. El impacto de los medios en la opinión pública y en el conocimiento. Barcelona: Ediciones Paidós Ibérica. McCombs, M. E. y D. L. Shaw (1972): “The agenda-setting function of the mass media”. Public Opinion Quarterly, Volume 36, Issue 2, 1 January, pp. 176–187. McCombs, M.E. (1996): “Influencia de las noticias sobre nuestras imágenes del mundo”. En Los efectos de los medios de comunicación: investigaciones y teorías, Jennings Bryant y Dolf Zillmann (coords. ), pp. 13-34. Pena de Oliveira, F. (2009): Teoría del periodismo. México: Alfaomega Grupo Editorial. Pellegrini, S.; Puente, S.; Porath, W.; Mujica, C. y Grassau, D. (2011): Valor agregado periodístico. La apuesta por la calidad de las noticias. Santiago de Chile: Pontificia Universidad Católica de Chile. Sánchez A., José Javier (2005): “Análisis de contenido cuantitativo de medios”. En Investigar en comunicación. Guía práctica de métodos y técnicas de investigación social en comunicación. Madrid: McGraw Hill Interamericana. Tamayo C. y Medina A. (2008): “Prensa y proceso electoral en Colombia 2007”. En Las elecciones de la prensa. Agenda informativa y calidad periodística. Bogotá: Medios Para la Paz y Centro de Solidaridad de la Federación Internacional de Periodistas. Uribe, D. (2012): 125 Años de El Espectador, parte 1 [Vídeo. Recuperado el 27 de octubre de 2017 de https://www.youtube.com/watch?v=4uJ04hpq-Nc]. Van Dijk, Teun A., (1990): La noticia como discurso. Comprensión, estructura y producción de la información. Barcelona, España. Paidós Comunicación. A. Ardèvol Abreu (2015): “Framing o teoría del encuadre en comunicación. Orígenes, desarrollo y panorama actual en España”. Revista Latina de Comunicación Social, 70, pp. 423 a 450. Article received on 10 September 2017. Accepted on 24 November.